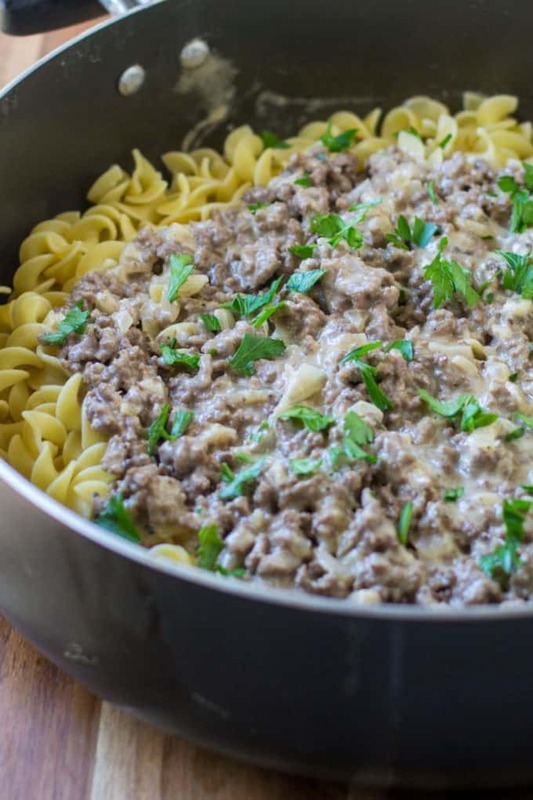 Ground Beef Stroganoff is a delicious and easy 30 minute meal idea that is sure to please the whole family. 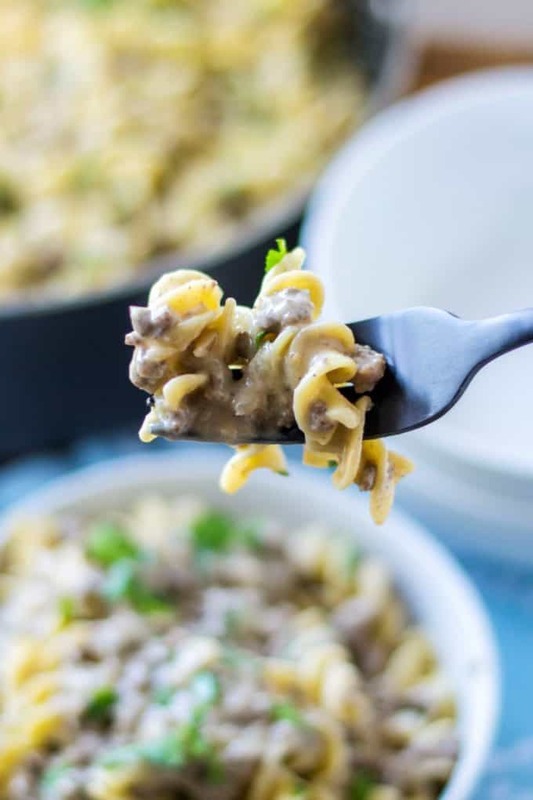 Creamy, hearty and made with ground beef and no mushrooms, this Ground Beef Stroganoff is the perfect quick meal for a fast dinner. There are just some foods I can’t get down with. Mushrooms is one of those dreaded foods that I am always so disappointed to find in my dishes. I don’t mind the flavor but that texture … nah! So imagine my happiness when I realized I can make an easy beef stroganoff recipe without mushrooms. 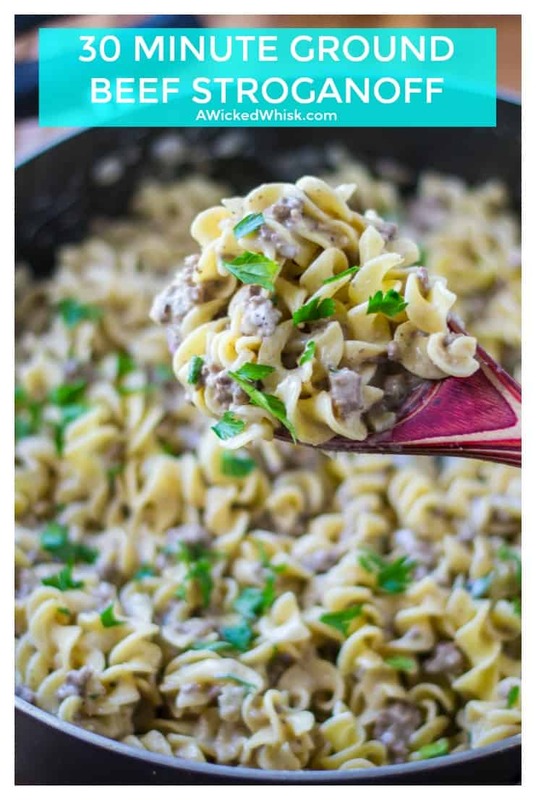 Better yet, I can write the best beef stroganoff recipe using ground beef and make that Ground Beef Stroganoff ready to hit the dinner table in under 30 minutes. Life is good, my friends. Beef Stroganoff is a mid-19th-century Russian dish of sautéed beef served in a sour cream sauce. 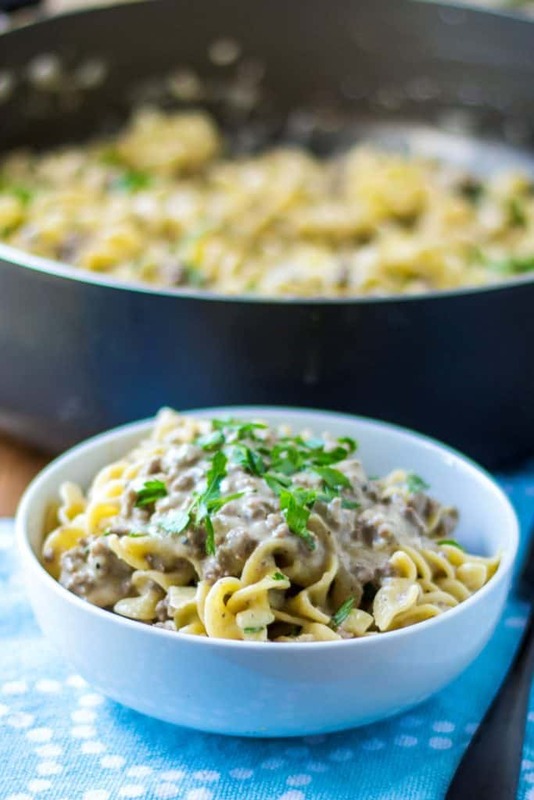 Although there are many variations of the beef stroganoff recipe, over time it has become commonplace to include mushrooms and often cream of mushroom soup and serve the beef stroganoff over pasta. CAN YOU FREEZE GROUND BEEF STROGANOFF? 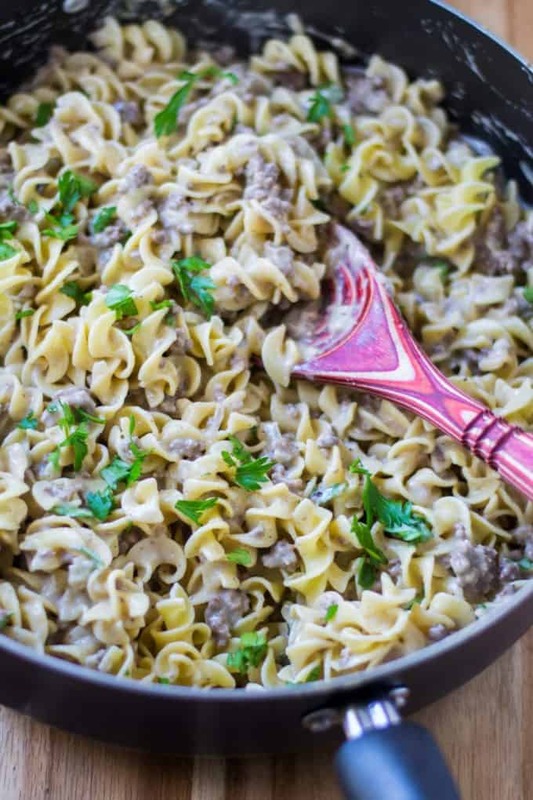 Ground Beef Stroganoff is a perfect dish to freeze. To make Ground Beef Stroganoff ahead of time, follow the instructions for the meat sauce and allow it to cool.Transfer the Ground Beef Stroganoff into a large zip-lock bag, removing the air as you seal. Lay bag flat in your freezer to save on space and freeze for up to 3 months. To serve, simply defrost in the refrigerator and warm in skillet over medium heat until hot. Serve with pasta. 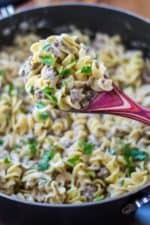 HOW DO I MAKE 30 MINUTE GROUND BEEF STROGANOFF? Easy! Start your Ground Beef Stroganoff by setting a large pot of salted water to boil and browning a pound of ground beef in a large skillet over medium-high heat. Once cooked, drain the grease and set meat aside. Add butter to the pan and once melted, add in the chopped onion. Cook onion for 2-3 minutes and then add in the minced garlic. Cook for anther minute and then add in the flour and whisk together. Pour in 3 cups of beef stock and whisk together. Add in salt, pepper, Worcestershire, Dijon mustard and spices and stir to combine. Bring to boil, stirring often. Once boiling, combine the last cup of stock and cornstarch together and pour into skillet, stirring to combine. Lower heat to simmer and add meat back into sauce. Once water comes to boil, cook pasta based on manufacturer instructions. Once pasta has cooked and has been drained, add the Parmesan and sour cream to the Ground Beef Stroganoff sauce and stir to combine. Serve Ground Beef Stroganoff sauce over pasta and garnish with parsley or chives. It doesn’t much easier or more delicious than THAT! 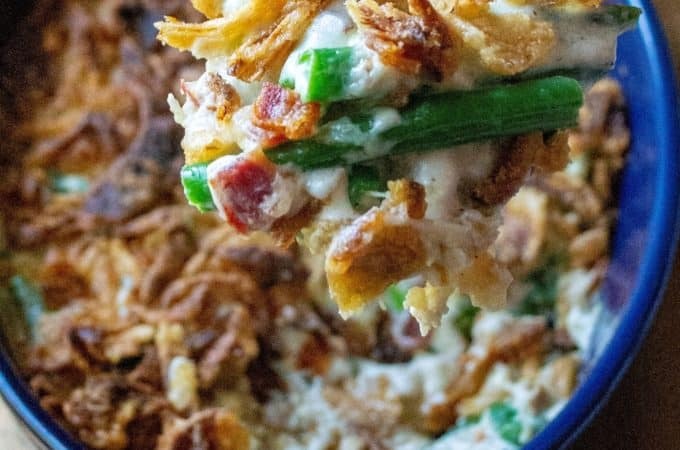 Have you made this recipe yet? 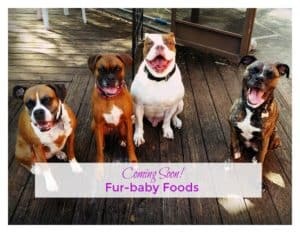 If you have tried this recipe, please take the time and leave me a Comment / Rating and let me know how you liked it ???? 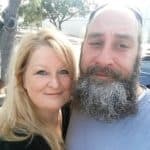 Your feedback and comments mean the world to me and help ME write recipes better recipes for YOU! Start by setting a large pot of salted water to boil and browning a pound of ground beef in a large skillet over medium-high heat. Once cooked, drain the grease and set meat aside. Add butter to the pan and once melted, add in the chopped onion. Cook onion for 2-3 minutes and then add in the minced garlic. Cook for anther minute and then add in the flour and whisk together. Pour in 3 cups of beef stock and whisk together. Add in salt, pepper, Worcestershire, Dijon mustard and spices and stir to combine. Bring to boil, stirring often. Once boiling, combine the last cup of stock and cornstarch together and pour into skillet, stirring to combine. Lower heat to simmer and add meat back into sauce. Once water comes to boil, cook pasta based on manufacturer instructions. Once pasta has cooked and has been drained, add the Parmesan and sour cream to the Ground Beef Stroganoff sauce and stir to combine. 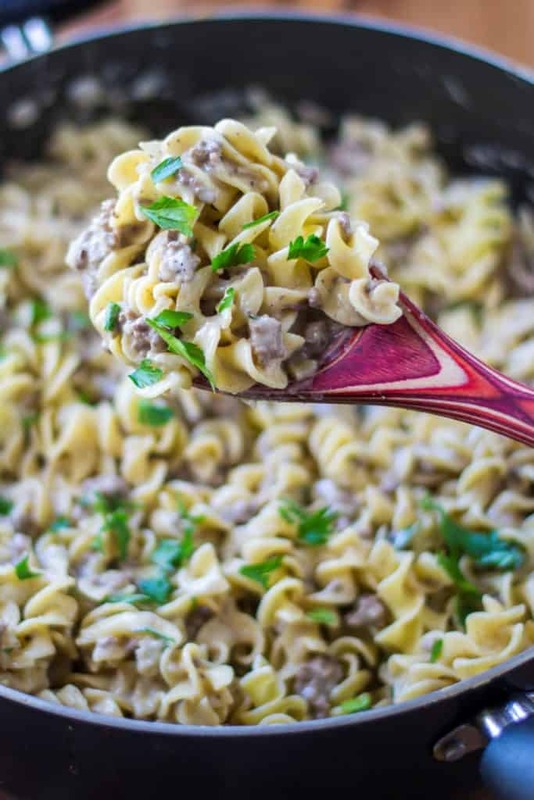 Serve Ground Beef Stroganoff sauce over pasta and garnish with parsley or chives. I totally love mushrooms, although my other half , like you, can’t stand the texture of them. He always says that the idea of eating ‘fungus’ puts him off 🙂 He’s a fussy eater! Anyway, your version of stroganoff looks great, that sauce looks so creamy, I will happily eat it, even knowing there are no mushrooms in it! After seeing these photos, I am now craving beef stroganoff! I love that this is a 30 minute meal… it just makes stroganoff seem much more approachable than I previously thought. Thank you! 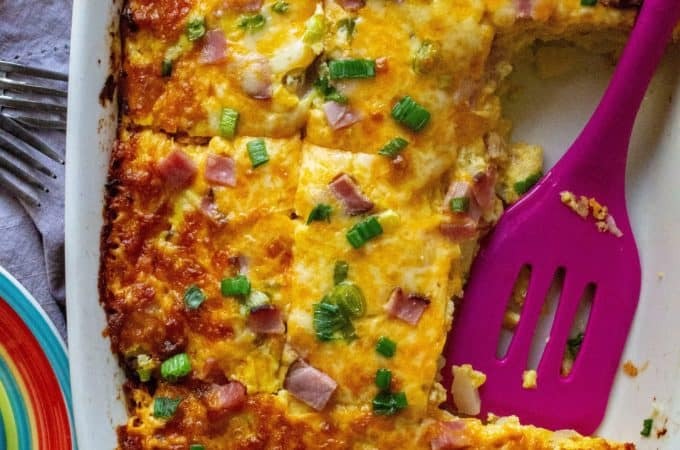 This looks great for a weeknight meal. So easy and tasty and wonderful that it’s ready in less than 30 minutes! Your version of beef stroganoff sounds especially delicious! No yucky cream of mushroom soup here. I love the fresh real ingredients. More wholesome and flavorful. I’ll pin this one for later. This looks like a great dish! I know my family would love it! Ooh this stroganoff looks just delicious! I love that it can be made in 30 minutes – can’t wait to try!!! Oh man do I love a good stroganoff recipe. 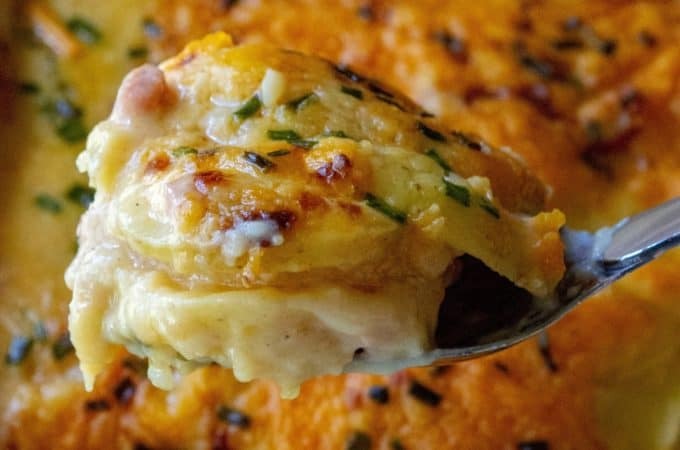 So creamy and hearty! Never thought to try it with beef before. Looking forward to trying it out! This is one of my favorites from childhood… so tasty and love it! Your stroganoff looks fantastic! Although I love mushrooms my sons do not, so I’m so happy I’ve come across this mushroomless recipe!